My dear friend visited Tallinn, Estonia recently and she went shopping in the Karnaluks crafts supplies store. She brought these lovely presents for me: some lace, ribbons, beads and threads. Karnaluks is a wholesale store which also sells to retail custumers. It is a huge store with very reasonable prices. My friend said it was very difficult to decide what to buy as you had so much to choose from. I hope I will get the chance to go shopping there with her some time. Hyvä ystäväni kävi Tallinnassa ja kävi shoppailemassa Karnaluks-käsityötarvikekaupassa. Hän toi minulle nämä ihanat tuliaiset: pitsiä, nauhaa, helmiä ja lankoja. Karnaluks on tukkukauppa mikä myy myös tavallisille asiakkaille. Kauppa on suuri ja siellä on hyvin kohtuulliset hinnat. Ystäväni kertoi, että oli todella vaikeaa päättää mitä ostaisi, kun valinnanvaraa oli niin paljon. Toivottavasti pääsen sinne joskus hänen kanssaan ostelemaan! congratulations for purchases, I particularly like the ribbon with yellow flowers! oh what wonderful treasures she brought you Minna! What a sweet, sweet friend! I think I would like to go shopping there too! 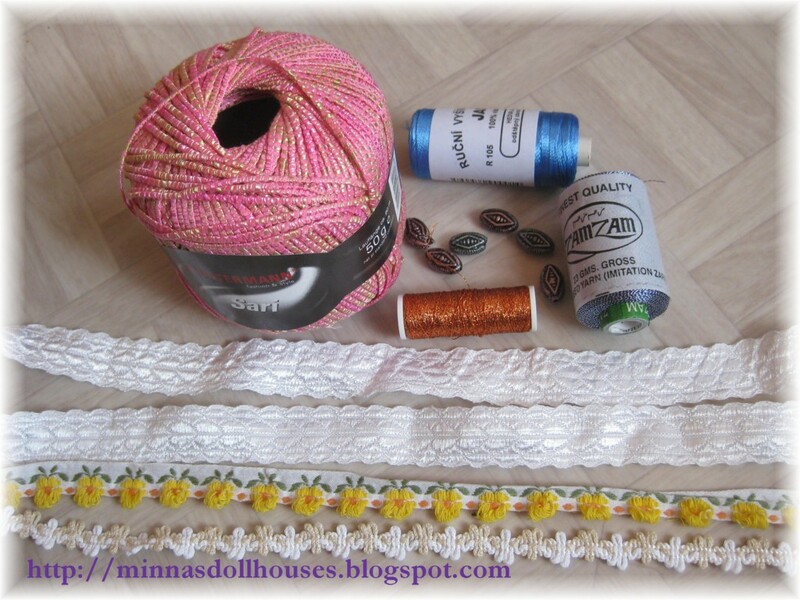 I love the copper colored thread and I want to touch the pink-golden one. Looks very interesting, is the pink yarn wrapped with a thinly golden thread? Great stuff - I like the ribbon with the yellow flowers too.